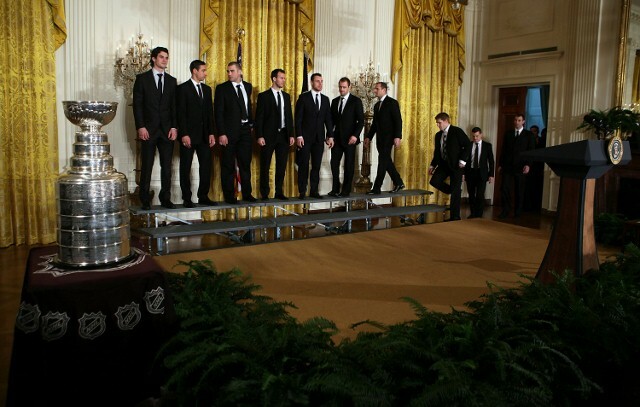 Continuing a Presidential tradition in which championship-winning teams visit the White House, the Los Angeles Kings will be in Washington, D.C. next Tuesday in between stops in Chicago and St. Louis on their upcoming road trip to be honored along with the Los Angeles Galaxy by President Barack Obama. After President Obama offers remarks on the dual Los Angeles titles, the teams will host a Let’s Move! event to on the South Lawn of the White House that encourages kids to participate in youth sports and maintain active, healthy lifestyle habits. The clinic will be supported by the Kings Care Foundation and MLS WORKS, a pair of community outreach organizations. Children that take part in the event will come from U.S. Soccer Foundation’s Soccer for Success and America SCORES programs and the National Hockey League’s Hockey is for Everyone program. “I think it’s interesting for our team because…[of] Brownie being American, right? [He’s] captain of an American team, American born. That, to me, is pretty cool for him. And then Greener is one of our assistants. He’s American. For 99% of the guys that have never been to the White House, that’s special also,” Sutter said. He also remarked last week that he was interested in raising the topic of the proposed Keystone XL Pipeline extension, which would originate in his native Alberta. “It runs right through the farm, all the way to Chicago,” he said.